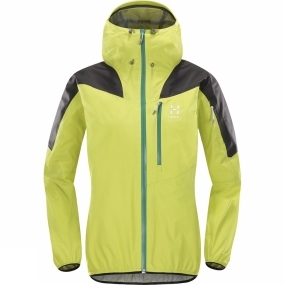 Designed for activity and built with ski touring specifically in mind, the Hagl�fs Women's Touring Active Jacket combines top-quality materials with minimalistic and mobile design.A three-layer Gore-Tex Active shell fabric is reinforced with three-layer Gore-Tex in areas of high wear and exposure, providing excellent water-resistance which won't be compromised by activity. The material was created to offer the wearer a good balance of waterproofness, breathability and freedom of movement: it's tough and versatile.The jacket comes complete with a wire-reinforced hood, to protect visibility. A large chest pocket has plenty of space for maps and other essentials - keeping them dry and secure - and the garment won't shift, ride up or move while you're skiing. What's more, reflective prints aid visibility.